In Google Chrome, you can search within a web page by pressing CTRL+F. 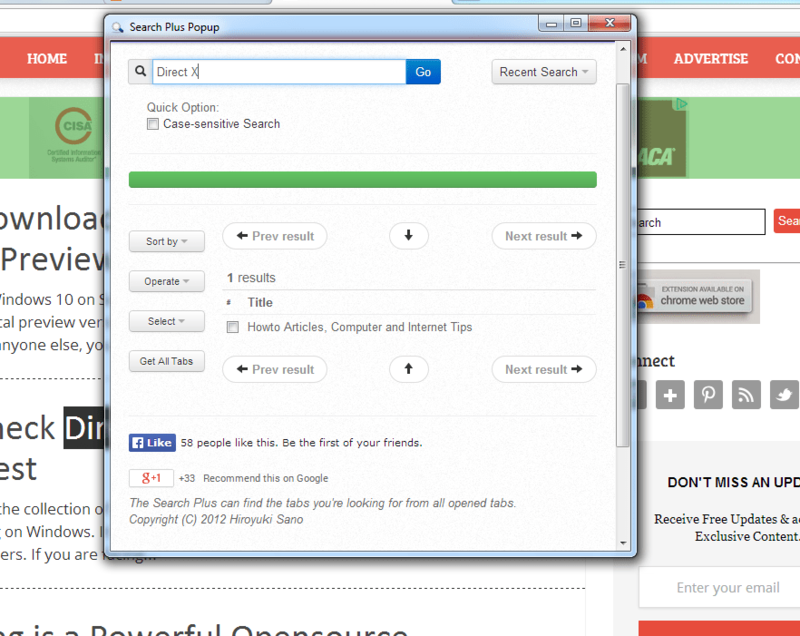 But what if you want to search for a specific keyword across all open tabs. You will have to search individually on all pages. There is a Google Chrome extension which lets you search across all open tabs. This extension is Search Plus. 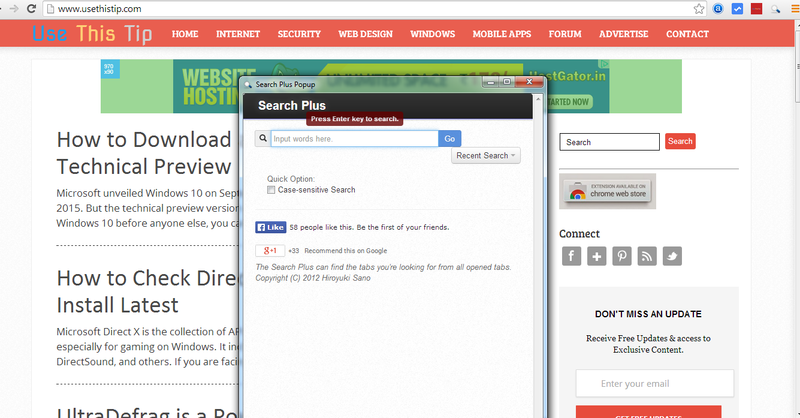 Download and install Search Plus Google Chrome extension in your browser. After installation, it will add a magnifying glass like icon in omnibar. Whenever you want to search across all open tabs, click on this search icon. Clicking on this icon will open a new pop-up window. 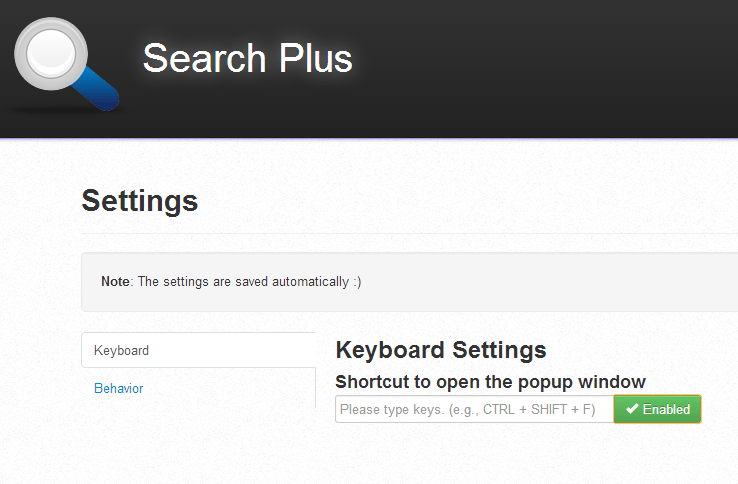 Here, you can enter the search keyword and then click on Go button. You can also specify if you want “Case-sensitive search”. Searching for a keyword will show search results in this Search Plus tab. You will see all search results along with few action buttons and sorting option. Clicking on the search result will take you to that browser tab. Operate drop-down offers various quick action to perform on selected tabs. You can close tabs, collect selected tabs on single window, insert specific text on title or content and more. You can also capture the selected tabs as image. You can als enable keyboard shortcut to open this search pop-up window. 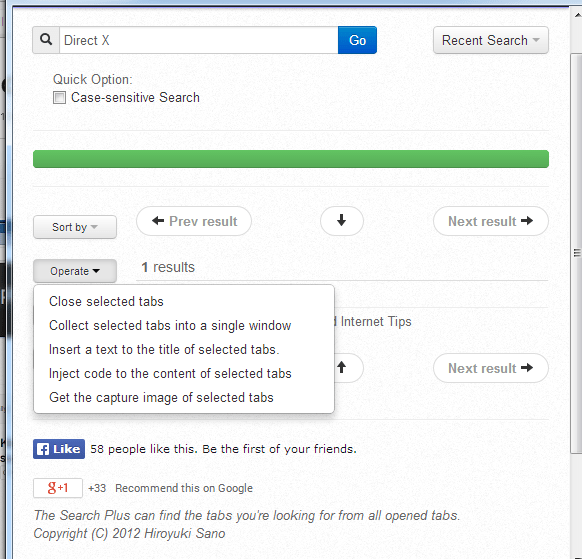 For this, click on omnibar search icon added by this extension and select options. In the options page, you will have to enable the keyboard shortcut option and then add a shortcut. I personally like the feature this Chrome extension offers. This tool is really helpful when you are researching on a topic. You can open many tabs relation to that topic and can search all tabs for specific keyword.